THE UNIVERSITY The State University of Iowa is 116 years old. It is located in Iowa City, which was the original capital of the state and is today a university town of 33,000 population. The community is served by the Rock Island Railroad and Ozark Airlines. The University is a part of the state system of higher education and is directed by a nine-member board of regents, appointed by the governor of the state. Today the University is composed of ten colleges: Business Ad- Arts, Medicine, Nursing, and Pharmacy. It is internationally known for many areas of specialization. Among them are creative arts, speech correc- tion, hydraulic engineering, and the work of the Iowa Child Welfare Re- search Station and the Hospital School for Severely Handicapped Children. Sixteen presidents have guided the course of the University, each play- ing a part in its development from a single building to an institution attended by more than 12,000 students. Dr. Virgil M. Hancher is the sixteenth presi- dent. The University campus includes more than 1,300 acres with sixty major educational buildings. The Iowa River divides the campus, with the medical, law, nursing pharmacy, fine arts, and theatre areas, the men's athletic facili- ties, and men's and married student housing on the west side of the river. Old Capitol The cornerstone of Old Capitol was laid July 4, 1840, two years after Iowa became a territory. Governor Robert Lucas presided at the ceremonies. Authorities are still arguing about whether Father Samuel Charles Mazzu- chelli or John Francis Rague designed Old Capitol. Here the territorial legislature became the state legislature when Iowa was admitted to the Union, December 28, 1846. 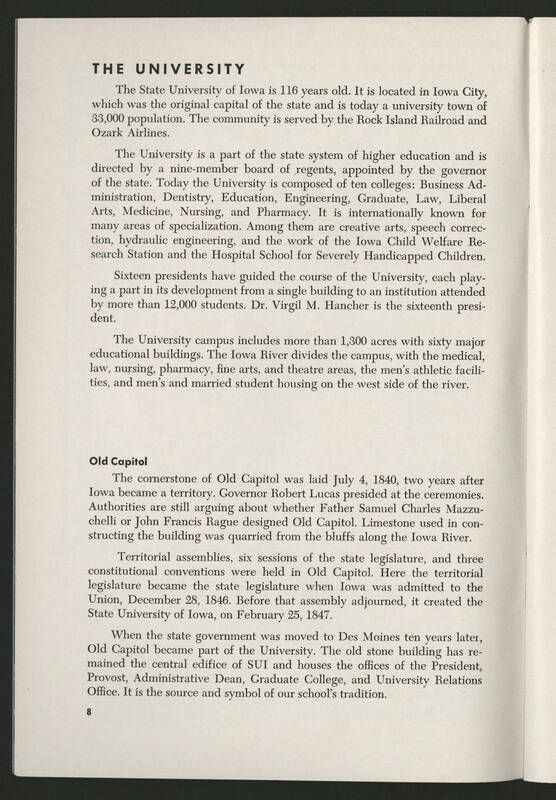 Before that assembly adjourned, it created the State University of Iowa, on February 25, 1847. When the state government was moved to Des Moines ten years later, Old Capitol became part of the University. The old stone building has re- mained the central edifice of SUI and houses the offices of the President, Provost, Administrative Dean, Graduate College, and University Relations Office. It is the source and symbol of our school's tradition.